Today is good day for somebody else to die! We almost like Discworld TOO much, so we start by trying our hardest to review GURPS Lite. After that, it’s a visit to the back of the Great Turtle in this licensed game that was actually written in part by the source that’s being licensed! 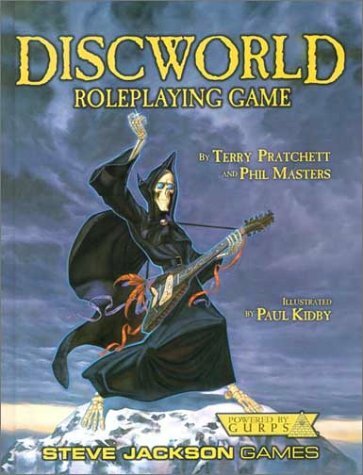 It’s Discworld, it’s powered by GURPS, and also there’s some music with rocks in. Honestly, a live-play RPG podcast using a system you like from you guys would be cool. I know you would have to get at least 2 more people, but it would be an awesome goal. We have the friends and the equipment, at this point the choke issue is time. We both work full time and we’re doing six to eight static episodes a month, along with the research that entails (mostly reading old RPGs and watching movies). Our likely next move is to just keep trying to produce good content and letting the listener base grow organically. Eventually we’ll need to evaluate what a realistic financial model that lets us dedicate the time it would take to AP and video content would look like. Something that lets us work part-time or do this professionally. Right now our fanbase is already being super generous and I don’t want to squeeze rent from that stone, so growing the base and spreading the word is probably priority one. This is probably a longer answer than you were looking for! We agree that an AP series would be awesome. I can’t reply to your reply on this system, but you could always plan, with extra content, something that’s every two months. Instead of every other week. Your next Patreon goal could be to make your own RPG. I mean, it’s basically you guys getting paid to write RPGs! Everyone wins. But they already did. The official Duckman RPG is a staple classic in everyone’s RPG library. Hopefull some game design team somewhere wants to bring us on as consultants or contributing writers at some point, because I want to get some experience with game design before I go making big promises. Another thing I will say about video content, if you guys don’t already have it, getting a youtube page would be a good idea. Even if you don’t have video content, a static background with your audio would be a good start towards promoting your podcasts. You were way nicer to GURPS than I was expecting. One of the big changes for the more recent edition was that they flattened out all of the exponential costs for stats and skills, and moved the base starting points up to 150, so it actually is pretty easy to get your parry to 15 or higher, and the system breaks down as you would expect. In the older editions, the points make it too costly to be really practical for most characters. Parry 15 would need an attack skill of 24, which you can get to at 150 points but you’re doing basically nothing else. You could buy Enhanced Parry but it tends to be more worth it to just spend those points on more of your attack skill of choice. Between turns you get one block (requires a shield or cloak), infinite parries at cumulative -2 after the first, infinite dodges but that tends to be the lowest defense score and most expensive to raise. Also, deceptive attack fucks with all of those. Weapon skill 24 is actually pretty cheap, since the cost flattens out to 4 per level – that’s roughly 50 or 60 points, for a skill you’ll be checking more than once per round, so it’s a better investment than just buying +3 worth of DX if you’re going to do a lot of fighting. Plus, it also lets you make called shots like crazy. If you’re worried about points, you could sell back four levels of DX, and then use those points to buy Sword at DX+19, and you still have your entire allotment of starting points. Contrast with the old editions, where a skill at (DX +10) would cost hundreds of points, and you needed to juggle racial traits and skill talents and so on in order to get a reliable parry. OH MAN! I’m totally gonna be making an album cover for this one. Clapps & Hayes: Jabber-Gees. I used to like gurps a lot more than I do now, and that’s more to do with my personal taste changing than problems with the game. The issue with attack rolls and defense rolls being unrelated might just be a gurps lite thing, or maybe a 3rd edition thing, or both. 4th ed has Deceptive Attack, a thing where you can take a penalty on your melee attack to force your opponent to take a penalty on their defense. Passive defenses are also totally gone in 4th, and defense ratings tend to be pretty low unless you’re some real high point level character, but then attack skills tend to be higher too, so deceptive attacks even things out again. I just found the Deceptive Attack rules, in the advanced combat section. It really just incentivizes throwing even more points into your weapon skill, if that’s the only way you can make someone else fail to defend. I can’t speak to GURPS implementation specifically, but I have been D&D derived games where they were used. And in my experience, the specific case cited in the podcast (encounter with animals) was essentially the model for how they are used. Say what you will regarding originalist worship of classic D&D, I’m a fan of recent mechanical innovations myself. That said, folks of the so-called “old school revival”, have done a pretty thorough job of disecting earlier editions to figure out why and how things were intended to be used. 1) To determine the courage of NPC allies and hirelings in adverse situations. Presumably simpler than statting out willpower ratings for all NPCs. 2) To determine the initial reaction of NPCs whose reaction could be reasonably be quite variable (i.e. not the average shop keeper, king or slavering monster). This seems meant to add an element of spontaneity for both the GM and players to play off of. I can think of at least one instance where this technique was used, and turned an encounter which, in retrospect, would have been a slaughter, into an interesting trade exchange based on mutual spiritual appreciation of cave art. In other circumstances though, I think it’s pretty common to avoid social rolls entirely. Instead just having the GM adjudicate how NPCs are most likely to react based on their normal outlook in combination with whatever ridiculousness the PCs currently are peddling.